If you haven’t been living in a cave deep in the forest or nabbing some cheese from the moon, you’ve probably heard the news that there will be a new animated Batman film. 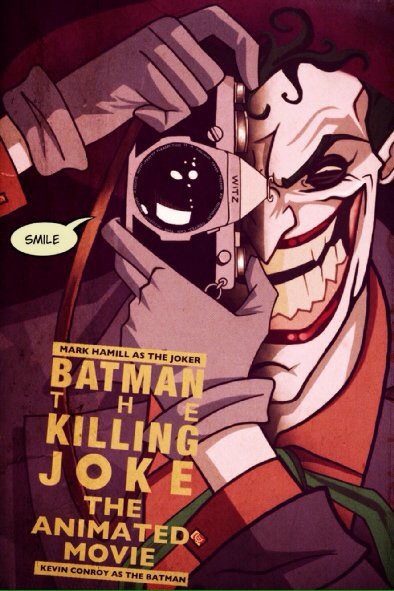 Batman: The Killing Joke will be an R-rated film based on Alan Moore’s 1988 graphic novel of the same title. They finally released the Blu-Ray DVD release date as August 2nd! That’s right! Get your pre-orders in now! I know I will be. One of the biggest reasons I am so excited for this film is that Kevin Conroy and Mark Hamill will be returning to lend their voice over skills to Batman and The Joker! If you loved the 1990’s Batman: the animated series, then you will recognize those names! Kevin Conroy (who also voiced Batman in the Arkham video game series) is by far my favorite Batman. And of course we can’t forget Mark Hamill (who also voiced Joker in the Arkham video games)! When he’s not playing Jedi, he is the fan favorite voice behind The Joker! If you’re sad that this film is rated R, try to remember that this particular story is very dark and not for the little ones eyes! But that doesn’t mean us grown-up nerds can’t enjoy the darkness of Batman and his arch-nemesis Joker! If you haven’t seen the trailer, check it out below! Be sure to get your copy of Batman: The Killing Joke on Blu-Ray August 2nd and digital HD version on July 23. Batman: The Killing Joke Official Trailer!